At first glance, Stalker would look like yet another token member, with him being the only African American on the team placed there for diversity’s sake. But it really didn’t matter to me that he was African American. All I cared about was that Stalker was definitely one of the cooler looking figures being the only one donning a camouflaged uniform and having a unique head sculpt sporting a beret. His unique appearance gives off the impression that he was meant to be one of the more heavily featured characters in the line. And He was. He’s often depicted as Hawk’s and later Duke’s right hand man and is one of the few breakout characters from the original 13. When I first looked at the card back, I thought that this guy was the leader. His card art depicted him running directly at you…I don’t know, as a kid that struck me as very leader like. 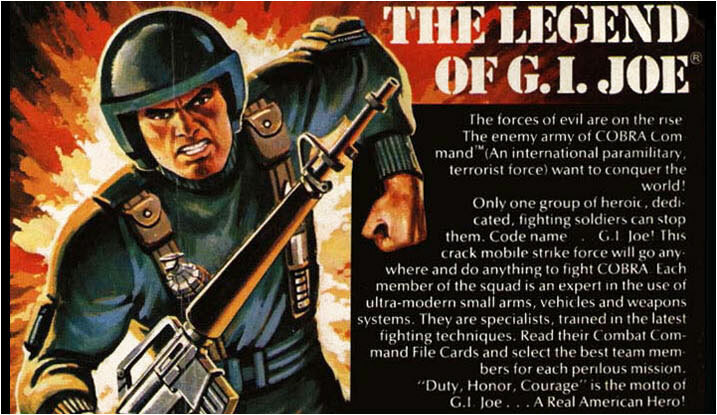 Plus, in the first toy catalogue, his card art is featured on the first page where the “Legend of G.I.Joe” is written. I also didn’t really know what the word “Grunt” meant in a military sense. I just thought he liked to grunt a lot cuz he ran so much. Turned out I was way off base as “grunt” actually meant a low ranking or unskilled soldier. While I don’t think Grunt was the worst Joe on the team, he definitely was the plainest looking and most easily forgettable. His most memorable stories that I remember were that of him leaving the team. In the comics he was honorably discharged so he could continue his studies (he eventually came back though). 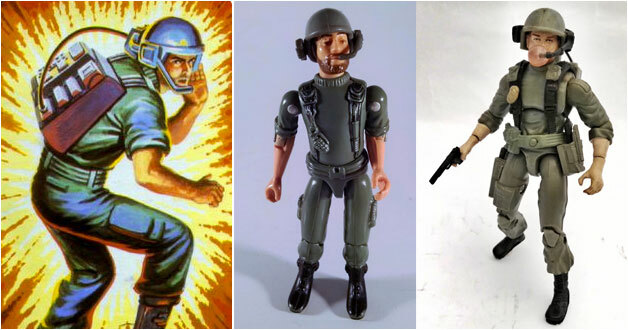 And in the cartoons, he, Steeler and Clutch traveled to an alternate dimension where Cobra had utterly defeated G.I.Joe. In the end, they all decide to stay in that dimension to rebuild the Joe team (such a convenient way to write off 3 original members of the team). 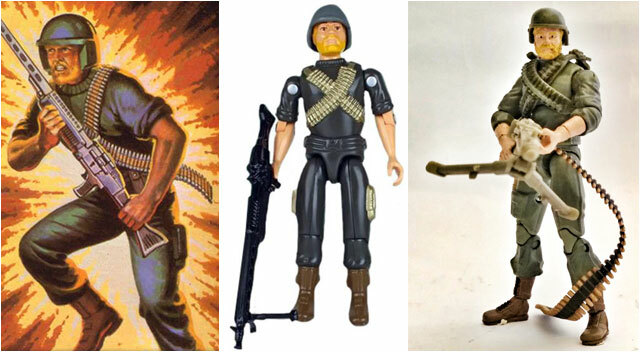 For some reason, as a kid, I had a bias against action figures with beards. I liked my heroes to be clean-shaven, sue me. This was probably one of the reasons I didn’t like Breaker very much as a kid. What was odd though was that his card art did show him as clean-shaven, which I could never understand. I felt that based on the card art, I had the wrong figure in my hands. Anyway, the main reason I didn’t like him though was that he didn’t come with any weapons. His main accessory was his head set which was unique and admittedly cool. Unfortunately, he was one of the figures my dad took the initiative to open up and place inside my G.I.Joe carry case and that little headset accessory somehow got lost in the transfer from packaging to case so all I got was some bearded dude with a helmet and a backpack. Hasbro did manage to make a more exciting modern update by not only giving him one, but two pistols that you could neatly holster. They also went the extra mile by giving him a semi shave as the new Breaker now just sported a lighter afternoon shadow. 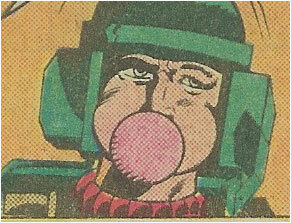 They also amusingly gave him a little bubble gum “bubble” accessory in homage to his comic book character that was known for constantly chewing gum and blowing bubbles. And speaking of the comics, Breaker has the unfortunate fate of being the first of the original 13 Joes in the original Marvel run to get killed. 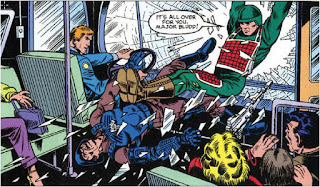 During a botched mission, Cobra captures Breaker and his fellow Joes. Eventually they manage to escape on a hijacked Cobra tank, but they don’t make it far as the tank is ultimately blown up. 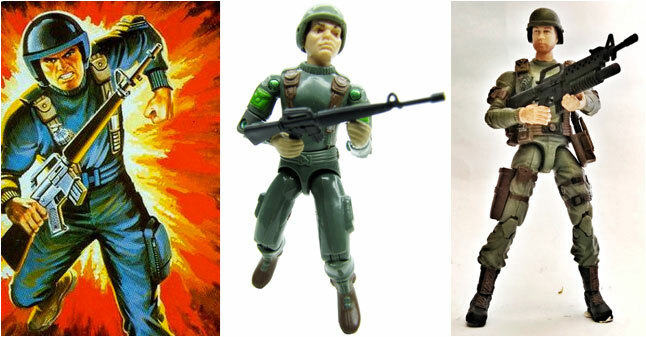 While a few Joes survive the blast, Breaker isn’t one of them. 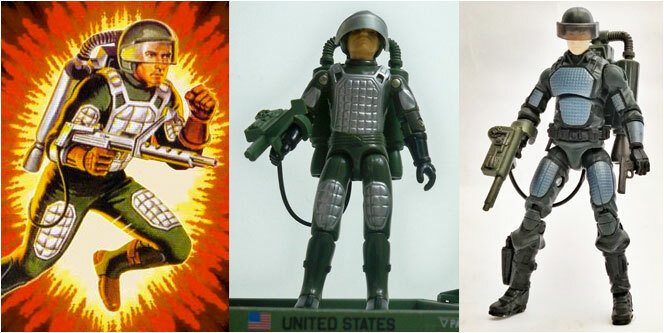 Of all the original Joes, Grand Slam was probably the most obscure. To be honest, there really wasn’t much to him. For starters he and Flash were basically the same figure, they only differed in head sculpt and instead of brown, he sported black gloves and boots. But everything else was the same, including the red padding that everyone associated with Flash. He was not sold single packed but instead came packaged with the Heavy Artillery Laser (HAL) that could be latched on to the VAMP. Anyway Hasbro pretty quickly must have realized their mistake in making him too similar to Flash and so the following year they re-released him with another playset, the Jet Unit Mobile Propulsion (JUMP) launch pad. This time around, they gave him a more unique paint scheme, now sporting silver padding. And from that point on I always identified him as the “jetpack guy” on the team. They managed to take a step back in his first modern version though, while retaining the silver padding, they basically gave him the exact same head sculpt as the new Flash. Eventually though they got it right in a later version, giving him his own unique head sculpt but curiously a more metallic blue color for his padding. Anyway, flashy padding aside, like I said there really wasn’t much to the character himself. He was barely in the cartoon and his only memorable comic appearance was when he captured Major Bludd by kicking through a bus windshield window to get to him in the original Marvel run. He fared even worse in the current IDW title, where he was basically introduced and then killed off by a sniper all in the same page. Well…. there really isn’t much to say about this guy…I kid. I think it’s a safe bet to assume that anyone who’s at least familiar with G.I.Joe, knows who Snake Eyes is.. Did you know that G.I.Joe’s most popular character was actually created by Hasbro as yet another attempt to save money. 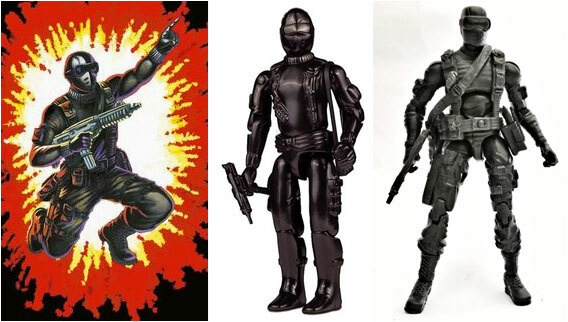 In order to further cut on production costs, they designed a figure clad all in black and wearing a non-descript mask so they could just save on paint by molding him in black plastic and do away with the need to paint any fine details like…a face. How ironic that a cost cutting measure eventually turned out to be the major cash cow for the franchise. Anyway while many people are more familiar with the “ninja” Snake Eyes, I prefer this original version where he was basically a commando. Now I’m not sure if Larry Hama, the Godfather of G.I.Joe and the one who wrote pretty much all of the character bios on the vintage filecards planned for Snake Eyes to be a ninja from the start, but based on his original text, he was always meant to be special as he is described as “mysterious”. Anyway I’m pretty sure I’m eventually going to write more about this guy in his own entry in the near future so I’ll stop here for now. Just like Breaker, Rock n’Roll’s beard did him in for me. It’s obvious from his filecard that he was meant to be the “cool” guy of the team, as he was a former surfer from Malibu California and a bassist from a local rock band. Unfortunately, I thought he looked more like an old man in his card art. In any case, that didn’t stop me from getting him when I saw him in a grocery store during a trip in to the US. Since I was travelling, I didn’t really have much else with me, so Rock n’Roll eventually won me over as he served as my travel buddy for about a month. He served as the original machine gunner of the team and he has managed to stay fairly relevant up to today despite the introduction of a more popular machine gunner a few year’s later. I always found this guy’s name rather odd as it reminded me more of that 80’s comedy “Zapped!”. I also figured that the name was more apt for the team’s electrician than a bazooka soldier. Oh well, I guess it would have been better than calling him “Kablaam”. Anyway Zap was yet another action figure that drove me nuts since his card art clearly showed that he sported a mustaches while his actual figure didn’t. It bugged the hell out of me. Mustaches aside though, it’s also worth noting that Zap was also Hispanic. In today’s world where diversity or lack of it is constantly scrutinized in pop culture characters, adding a Hispanic character to the team to appease the masses would have been expected, but back in the 80’s it wasn’t. So it was fairly progressive on Hasbro’s part to take the initiative in creating a fairly diverse initial team of Joes without making a big issue out of it. 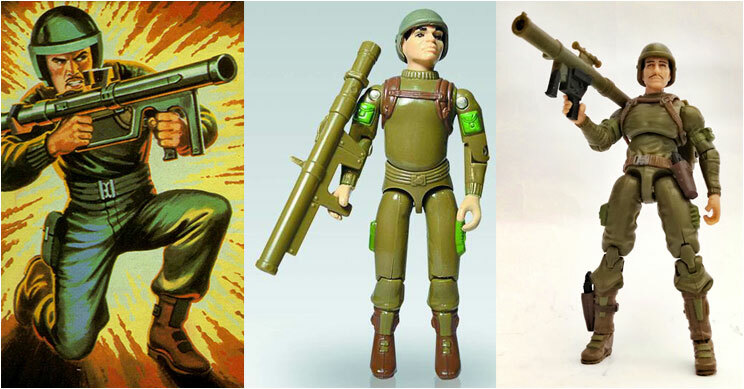 Zap was just a soldier like all his other teammates who just happened to be Hispanic. Zap was the final member of the team to get a modern update and thankfully, to put my mind at ease, they gave him his moustache! 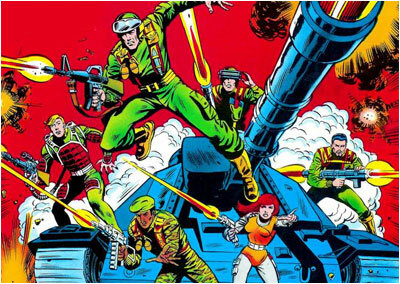 So there you go, a rundown of the first members of G.I.Joe collectively known as the original 13. As a team they were only given their due recognition in the original Marvel run. But by issue #11, newer characters started getting introduced in the series on a regular basis to keep up with the ever-expanding toyline. 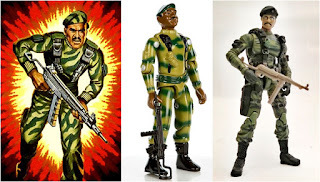 It wasn’t long before members of the original 13 that weren’t named Stalker, Scarlett or Snake Eyes were pretty much forgotten and replaced by newer and more visually exciting characters. But for a collector like myself who started collecting from the very beginning of the toyline, I will always have a special appreciation for the Original 13. The first Real American Heroes.